Sunday morning and I set off from Ferring in good spirits. My husband drops me off at a small car park. I walk past beach huts and a little cafe. The cafe already has some customers, enjoying breakfast or a morning coffee. The beach is shingle and, as I stumble and slide on the stones, I wonder how difficult the walk today will be. Rounding a gentle curve in the shore, I see there is a footpath running along the top of the beach. Ahead is an area of green grass and the footpath leads across this. I am grateful for the firm walking. People begin to appear – dog walkers, hikers, joggers. This is the Kingston Gorse Estate – apparently private property – but with a public footpath crossing it. The estate cannot resist erecting warning signs. 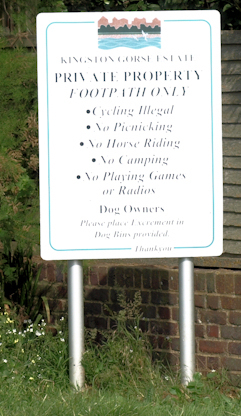 All fun of any sort is strictly forbidden. Luckily, walking is allowed. Further on, I pass by some very fine houses. The sky is full of fair weather clouds and there is a haze on the horizon. It is warm, but not hot. There is a good breeze today and sailing ships are out on the sea. In the far distance, across the water, I see the curve of a shoreline. Is that Selsey Bill, I wonder? The tide is going out and I walk down the beach to the edge of the sea. There are patches of firmer sand among the shingle and I walk beside the waves. 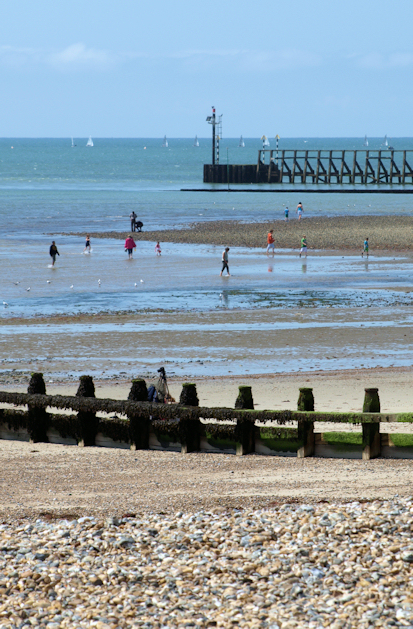 Rows of wooden groynes run down across the sand. Their ends are under water and I can’t walk round them. So, I climb, jump or scramble over them. Every so often, if a particularly high one blocks my way, I have to take a detour up the beach to get round the top end of the obstruction. At top of the beach are rows of bright beach huts. Very few are in use on this fine July morning. I wonder if it gets busier here when the schools break up. But the beach is still mainly shingle and not ideal for family holidays. 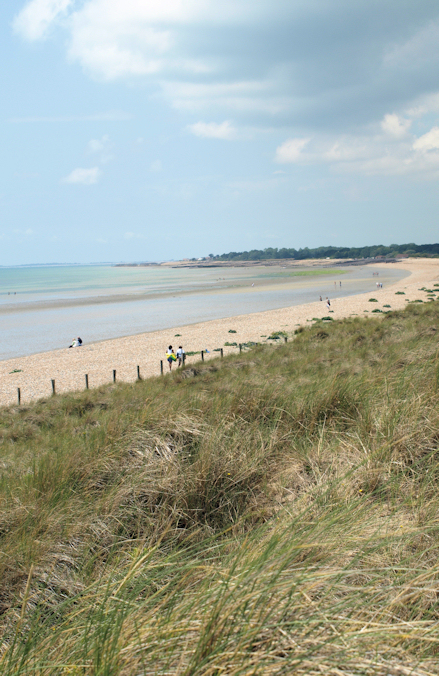 I am passing through an area called West Kingston and then head towards Rustington, on the outskirts of Littlehampton. I stop on some rocks and have a snack. I attempt a self-portrait. This involves balancing the camera on a stone and setting the timer. I use my rucksack to focus the shot. Then I run to perch, nonchalantly, beside it. Unfortunately, the resulting shot gives a good view of the lower part of my body, but cuts off part of my head. As the day progresses, more and more ships appear. There are sailing races going on. As I walk along the top of the beach, through Rustington, I notice this plaque. Two world air speed records were set here; or, to be accurate, in the air just off shore from here. Both records were set about 60 years ago – before I was born – and have since been broken. But I am impressed. One was set in 1946 for an air speed of 616 miles per hour. The other was in 1953 for an air speed of 727 mph. I had no idea there were planes that could go so fast, all those years ago. More information about air speed records can be found on Wikipedia. The official fastest air speed is now 2,193 mph, set way back in 1976 – when I was still at medical school. It is hard to believe that record has remained unbroken for the past 35 years. As I approach Littlehampton, I walk along a wide pavement, just above the vegetated shingle bank. Later I see some weird benches and street furniture – a continuous, slatted bench, ‘the longest bench in Britain’, which loops in places to form interesting shapes. Unfortunately, I couldn’t take any good shots, because there were too many people about. Ahead, on the beach, I can see a small pier extending out to sea. This marks the mouth of the River Arun. The tide is out, and people are walking on the sand and along the pier. I stop and have a drink and snack. Across the river mouth, just 50 feet away, is the next part of my walk. But to cross the river I have to head into Littlehampton to find a bridge. Beyond the narrow river mouth, the river opens up into a lovely harbour area. 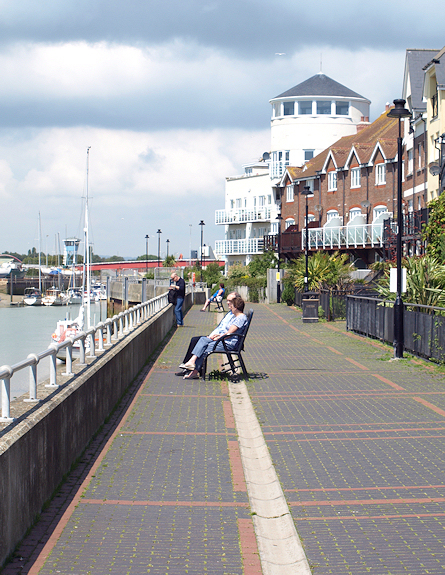 Walking into Littlehampton, following the riverside walk, is a joy. There are new buildings – cafes, houses, shops – and a new walkway along the river with seats and nice paving. This really enhances the town. I remember how I tried to walk along the river at Faversham (North Kent) and how access to the riverside was barred, on both sides of the river, because the developers had been allowed to take over the bank as ‘Private Property’. Faversham was a lovely market town but failed to make best use of one of its main assets – the river. Faversham’s planning committee should be ashamed of itself. Look what can be done. Look at Littlehampton. This is how to develop a river bank so that everybody can enjoy it. I find a footbridge crossing the river. It appears to be resting on rails, as if it can be pulled back to allow larger ships to pass by. The rails are overgrown with weeds and I assume it is not in use. But later, I find you can ask the harbour office to retract the bridge if you need to get through. As I cross the bridge, I see something odd. There is fire truck on the quay and a group of firemen. Further along, there is a fire hose spraying water in a huge jet across the river. The hose is unattended. I wonder if they are practising or if there has been an incident. On the other side of the river, there is no lovely walk – just a footpath that follows the river bank. There are ships – some abandoned – lying in mud alongside broken down jetties and derelict wharves. I quite enjoy the run-down feel to the area. As I approach the mouth of the river, I see the place where I stopped for a drink and snack. I feel I can almost reach out and touch the seat I sat on; so close – but it has taken me almost an hour to get round to this side of the river. I see something I couldn’t see from the other side. 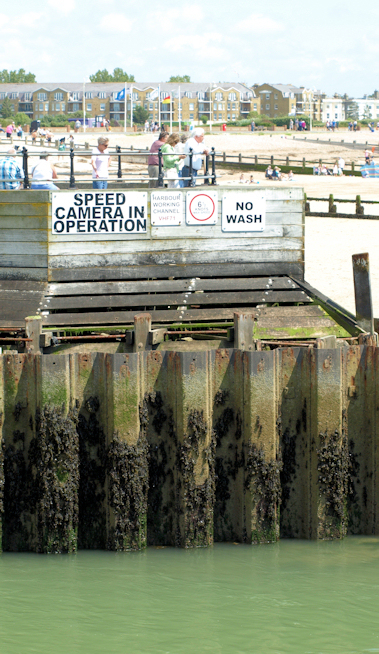 A speed restriction sign for boats. And a warning about speed cameras! No escape from the wretched things. One reason for the speed restriction is the narrowness of the entry to the river. Another reason is the swans. There are hundreds of them along the shore and they form a crowd on the other side where people are walking, hoping for food. This area is called ‘West Beach’. A narrow road leads up to the shore and ends in a small car park. There is a cafe here. People are sitting in the sunshine, eating lunch, talking and laughing. A sandy bank leads down to the beach. It looks lovely and, if on my own, I would have stopped here for lunch. But I have arranged to meet my husband in a pub further along the coast – at Atherington, Climping Beach – so I keep walking. 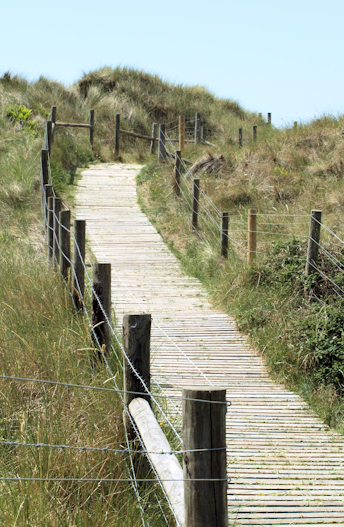 I follow the fenced footpath up through the dunes. The going is easy because the path consists of slats of wood. 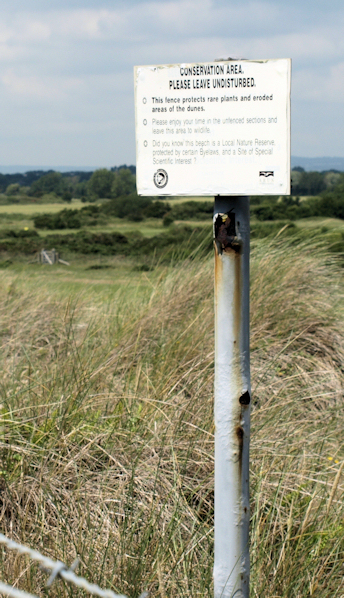 The fencing is designed to protect this area of the dunes from wear and tear, preventing erosion. Signs explain why. The dunes are sustained by the plants that bind them and dune grass is very fragile. I remember how the dunes in Norfolk were similarly protected. 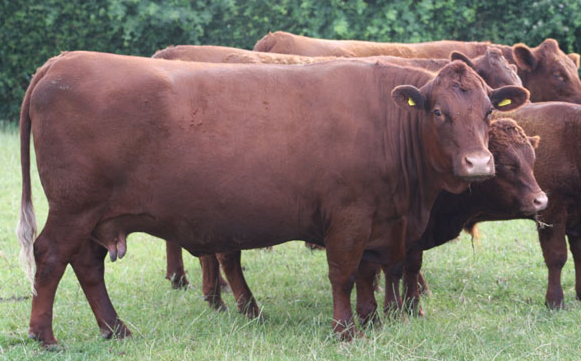 Further on, the fencing disappears and it is possible to roam freely, if you wish. When I reach the top of the dunes, I gasp. What a fantastic view! Before me, a long, wide, curving beach with sand. Sand, glorious sand, as far as the eye can see. And, as the tide is out, there is plenty of it. The light is in my eyes, flashing off the far away sea, reflecting off the beach, dazzling me. In the distance I see other people out on the sand – walking, running, digging, playing, exercising dogs. This is lovely. walk further out, going into areas where the sand is still wet, splashing through shallow water and not caring if I get my feet wet. My walk is nearly over. And this is the best bit so far. Inland are some old fortifications and, after a while, I come to a where a road gives access to the beach, ending in a car park. As I head inland, approaching the car park across the wide expanse of sandy beach, I see my husband waiting for me. I can tell it is him. 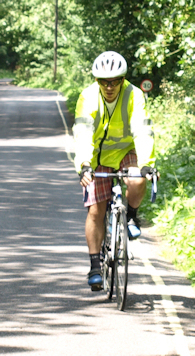 He is in full cycling gear, has his bike beside him and is wearing a bright yellow fluorescent jacket. As I get nearer, he turns away and disappears. Where has he gone? When I reach the road, there is no sign of him. I begin walking up the road towards the pub and text him, ‘where r u?’. He hadn’t seen me walking across the sand. He cycles back down the road to meet me and we travel up to the pub together – he cycles as slowly as he can and I walk as fast as I can manage (which isn’t very fast). The pub is crowded but we find a table outside and enjoy a lovely lunch in the sunshine, before heading home. Vital stats: distance = 8 miles. 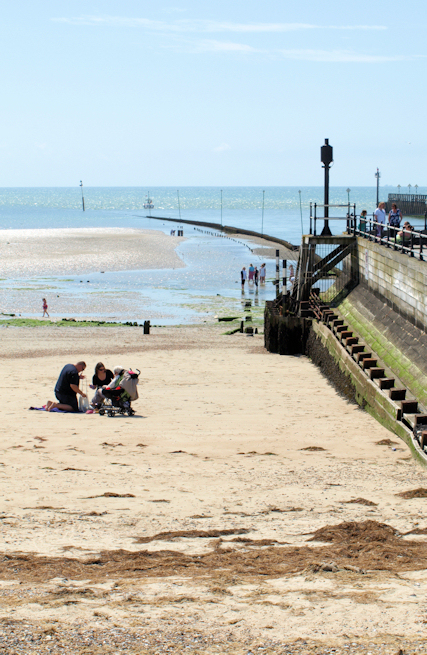 Best parts of the walk: Littlehampton and its West Beach. 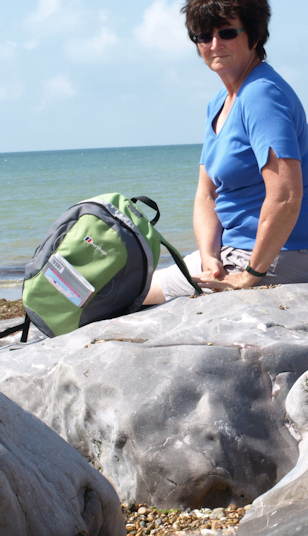 This entry was posted in 06 Sussex and tagged beach, coast, hiking, travel, walking. Bookmark the permalink. Hi Jane, glad you enjoyed reading about my walk. 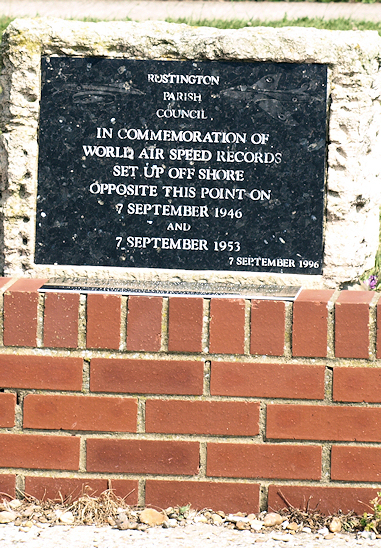 It took me 1 hr and 20 mins from the Blue Bird Cafe to the Rustington air speed record plaque. (according to the time shown on my camera!) But I walked very slowly and stopped for a snack. So should take about an hour, I think. I enjoyed reading your blog. If you returned this summer, you would discover that the old ‘Palmerston’ fort behind the dunes and café is being restored by volunteers. Brickwork from the 1800’s, shrouded for decades by tons of ivy, has been opened up to view and looks astonishingly clean. Also, I have a little bee in my bonnet about public toilets, which are increasingly rare. At West Beach there are public toilets. (Hooray!) They are clean and have an automated supply of water, soap and hot air to the basins (Cor!) They cost 20p (Boo). The little café, The West Beach Café is a ‘sister’ café to the more famous East Beach Café and is dog-friendly. Ruth, I know you post your miles for each section of walking but do you keep a running total – how many miles have you done to this point?